I was talking to Simon about them yesterday and I reminded him how popular they are. I told him he shouldn't mess around with new designs, he should just make them in various fabrics. (02-12-2017, 05:57 PM)Sean Longden Wrote: I was talking to Simon about them yesterday and I reminded him how popular they are. I told him he shouldn't mess around with new designs, he should just make them in various fabrics. The Big B Chinos, yes, absolutely. But remember, they are a different pattern to the Big B Dungarees / denim jeans. Well depends. If the "yet to be named" trousers are even more high waisted and have a buckle in the back I wouldn't complain. Question for anyone who can answer. 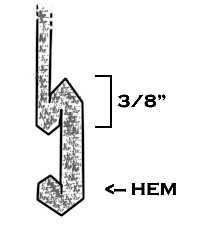 With them unpicked I only have an extra 2.75" of material on my grey herringbone Big B's which obviously isn't gonna give me the 2" turnup I want. So what should be done in a situation like this? Just turn them up like jeans and steam iron to hold the cuff. You can take them to an alterations tailor and have false cuffs added. 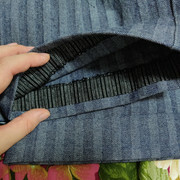 Yes, the tailor can add a piece of similar fabric to the part that is missing. I have them on several vintage trousers and you can't spot that they are faux cuffs unless you examine them. It is the vaugan. What did I win? so could you please tell me what ist coming in the current Big B's pattern Simon? Im considering the tan and the khaki in big b wide leg cut. Only that will be 3 sizes.